Broken Dishes is a foundation paper pieced table runner pattern. The pattern includes enough foundation papers to complete (1) table runner. Cover samples are made out of the Petals & Vines Batik collection from Hoffman Fabrics and the Me + You fabric collection also from Hoffman Fabrics. Size is 18" x 54"
This pattern is Quiltster Compatible! This means you can color the quilt with your favorite Fabric Collection in Quiltster before you make it! 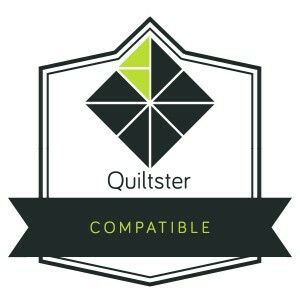 If you do not have a Quiltster account already, subscriptions can be obtained by going to http://www.quiltster.com, click on Subscribe!